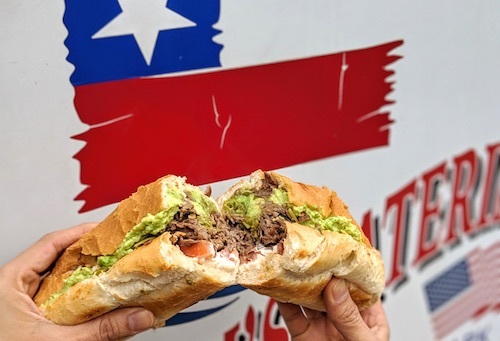 In 2015, Time Magazine put out a list of the 13 most amazing sandwiches the world has to offer, one of which was the Chilean chacarero. 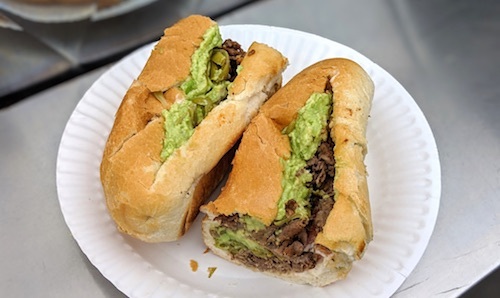 The thinly sliced beef sandwich with green beans, tomatoes, and avocado is ubiquitous in Chile, usually eaten quickly and casually with a glass of beer at a no-nonsense restaurant. 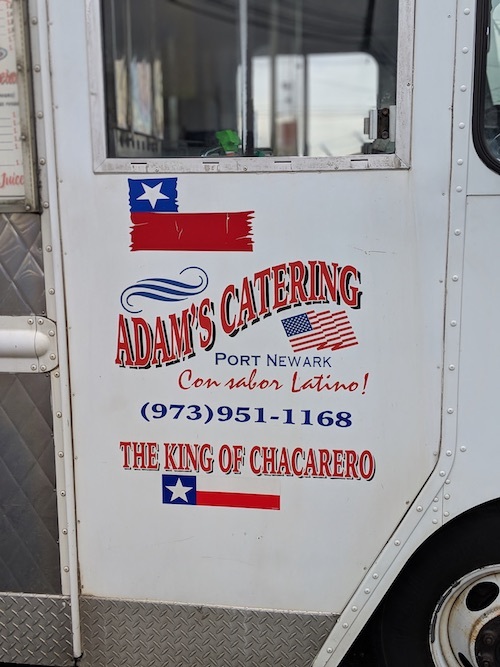 We recently tracked down the self-titled "King of Chacarero" at Port Newark, on the street leading into the docks where all the cars come in from around the world to be sold here in the states. 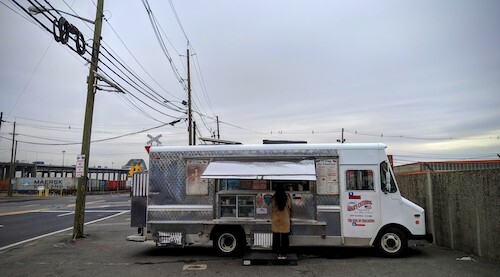 As truckloads of new vehicles were taken to various East Coast dealers, a lunch truck sets up shop for most of the day to cater to drivers and other port workers. 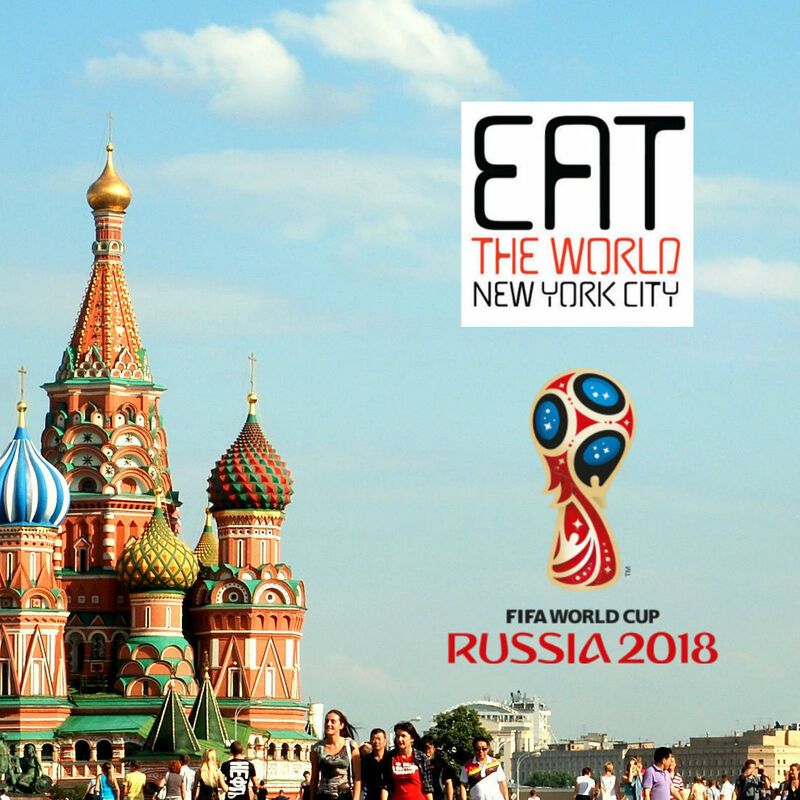 The proprietor is from Chile, but knows his audience and makes a long list of US and Latin American sandwiches. A small section of the menu is reserved for his Chilean items, but start with the namesake ($8.75, above and below). As with many things in Chile, avocado is spread all over. Harder to see is a layer of green beans, which make the sandwich unique. Lastly, the very fresh bread holds tomatoes and mayo, but worth asking for might be a couple chili peppers for a kick. We were not asked if we wanted any, but this is more common in the versions I ate in Chile. 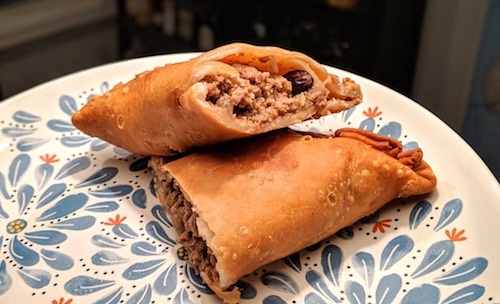 He also makes Chilean-style beef empanadas ($3.75, below), which have olives and raisins inside. More often these are baked in an oven, but he makes a thinner version that is deep fried, probably out of necessity given the limitations of the truck. Online reviews rave over many of the other sandwiches he makes like the cubano, but it would be hard to stray from the chacarero unless you are able to come here often. 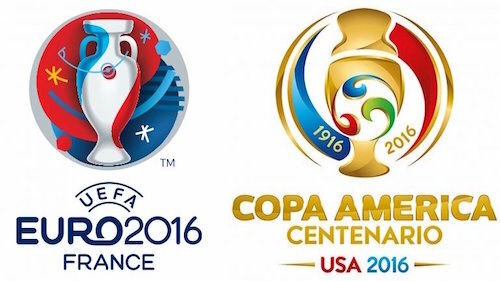 It is no accident that the truck has a few flags of Texas on it as well, which looks much like the flag of Chile. His son lives in Texas and seems to have a presence in his dad's thinking and spirit. Either way, finding the spirit and foods of Chile down here at Port Newark was an unexpected joy.